How are you doing. Thanks for your photo and idnetity. a role to play in this transaction, everything will not be left for me alone. I will do my own part with my position and influence here in the bank to make sure that this fund is released in short period of time to your bank account. I will also guide you to the best way forward in this transaction. 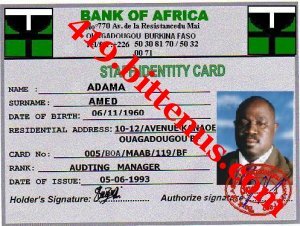 But your role which you will play is that it willbe very important that you open a NON RESIDENTFOREIGN ACC with the bank here, this acc will be open with your name through the help of the bank legal chamber. It will help us greatly to smoothen and facilitate the easy transfer of the fund to your bank acc in your country, and this why it is very important. for me and I will take care till the fund arrived your bank acc in your country. You should let me know if you are willing and capabloe to handle this with me and I will tell you the next step to follow immedaitely. take care and have a nice time.